605 57th St Oakland, CA. | MLS# 40859327 | Andrew de Vries, Probate Real Estate, San Francisco Probate Real Estate, Oakland Probate Real Estate, Berkeley Probate Real Estate, Alameda Probate Real Estate, Lafayette, Contra Costa Probate Real Estate, Probate realtor, Probate agent, Probate Broker. 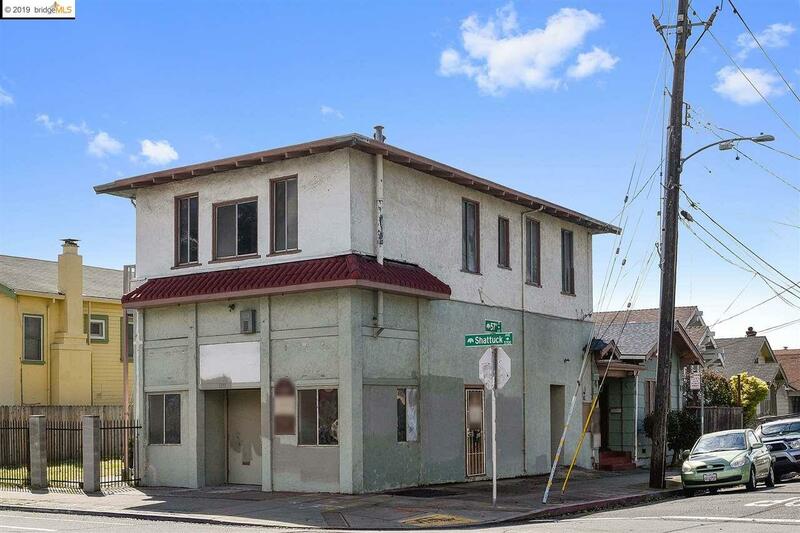 Rare opportunity to purchase a 3-unit Mixed Use Property in the Hot Bushrod area of Oakland at the corner of Shattuck Ave and 57th Street and make it your own! The property, which is currently zoned Religious Purposes & shows on the Public Tax Records as measuring 3,605 Sq Ft of interior space, features a large ground-floor commercial space with Shattuck Ave frontage & entrance down PLUS two residential units, one above the commercial space and one behind it, both with separate entrances on 57th Street. The residential unit above the commercial space features 3BDs/1BD, and the rear residential unit features 2BDs/1BA PLUS bonus rooms. Delivered vacant at close. The corner lot, which shows as 4,235 Sq Ft per the Public Tax Records, features good street visibility for commercial purposes, as well as ample side and back yards with parking potential. Buyers to verify all square footage, possible rezoning/use options, bed, bath & room counts, & any non-permitted work and or additions.